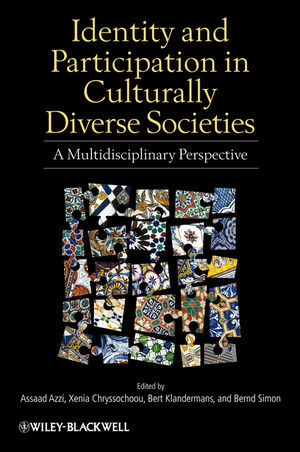 Identity and Participation in Culturally Diverse Societies presents an original discussion in an edited volume of how the links between identity, political participation, radicalization, and integration can provide a scientific understanding of the complex issue of coexistence between groups in culturally diverse societies. Assaad Azzi is Professor of Psychology and Director of the Social Psychology unit at the Université Libre de Bruxelles. His research focuses on identity, resource-distribution, and the perception of justice and injustice in majority-minority relations. Xenia Chryssochoou is Associate Professor at Panteion University, Athens. She currently works on mobility, migration and justice and on perceptions of globalization and political participation. Bert Klandermans is Professor in Applied Social Psychology at the VU-University, Amsterdam, The Netherlands. He is co-editor (with Suzanne Staggenborg, 2002) of Social Movements, Protest, and Contention and co-author, most recently, of the Handbook of Social Movements Across Disciplines (with Conny Roggeband, 2007). Bernd Simon is Professor of Social and Political Psychology and one of the Directors of the Institute of Psychology at the Christian-Albrechts-University in Kiel, Germany. His research investigates inter- and intragroup processes. Introduction (Xenia Chryssochoou, Assaad E. Azzi, Bert Klandermans, and Bernd Simon). Part I Development, (Re)Construction, and Expression of Collective Identities (Xenia Chryssochoou). 1 The Role of Nationalism, Ethnicity, and Class in Shaping Greek American Identity, 1890–1927: A Historical Analysis (Yannis G. S. Papadopoulos). 2 Religious Identity and Socio-Political Participation: Muslim Minorities in Western Europe (Maykel Verkuyten). 3 The Bicultural Identity Performance of Immigrants (Shaun Wiley and Kay Deaux). 4 Perceptions of (In)compatibility between Identities and Participation in the National Polity of People belonging to Ethnic Minorities (Xenia Chryssochoou and Evanthia Lyons). Part II Collective Identity and Political Participation (Bernd Simon). 5 Winners and Losers in the Europeanization of Public Policy Debates: Empowering the Already Powerful? (Ruud Koopmans and Paul Statham). 6 New Ways of Understanding Migrant Integration in Europe (P. R. Ireland). 7 Collective Identity and Political Engagement (Bernd Simon). 8 Collective Identity, Political Participation, and the Making of the Social Self (Stephen Reicher and John Drury). Part III Radicalization (Bert Klandermans). 9 Radicalization (Jacquelien van Stekelenburg and Bert Klandermans). 10 Citizenship Regimes and Identity Strategies Among Young Muslims in Europe (Catarina Kinnvall and Paul Nesbitt-Larking). 11 Going All the Way: Politicization and Radicalization of the Hofstad Network in the Netherlands (Martijn de Koning and Roel Meijer). 12 Trajectories of Ideologies and Action in US Organized Racism (Kathleen M. Blee). 13 No Radicalization without Identification: How Ethnic Dutch and Dutch Muslim Web Forums Radicalize Over Time (Jacquelien van Stekelenburg, Dirk Oegema, and Bert Klandermans). Part IV Integration (Assaad E. Azzi). 14 Immigrant Acculturation: Psychological and Social Adaptations (John W. Berry). 15 Ethnic Social Networks, Social Capital, and Political Participation of Immigrants (Dirk Jacobs and Jean Tillie). 16 Naturalization as Boundary Crossing: Evidence from Labor Migrants in Germany (Claudia Diehl and Michael Blohm). 17 Confronting the Past to Create a Better Future: The Antecedents and Benefits of Intergroup Forgiveness (Nyla R. Branscombe and Tracey Cronin). Conclusion: From Identity and Participation to Integration or Radicalization: A Critical Appraisal (Assaad E. Azzi).